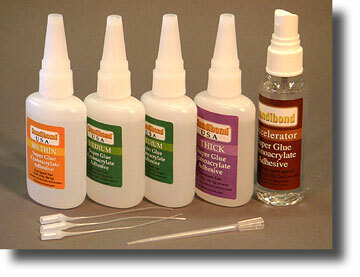 This package of high-quality Handibond CA is tailored specifically for the Venture 60 kit. Use the thin for general construction and easy hinges. Medium CA is used for all the lite-ply and for reinforceing all the glue joints in the wing. The long glue tip really comes in handy for reaching all the nooks and crannies. In addition to the CA, I recommend purchasing some aliphatic resin (yellow glue like Tite-Bond or Elmers wood glue) and some slow-dry (30-minute) epoxy. The instruction book often specifies certain glues for certain steps. Click Here for more Handibond Product info.